Unity candles, unity sand ceremonies, unity salt ceremonies, unity cocktails, and even the UNITY SANDWICH! Rachel and her groom decided that the ever-popular sammich was the ideal metaphor for their marriage. Unity ceremonies are a great way to symbolize the bringing together of two individuals into one partnership and, at times, the blending of families. Here are a few of my favorite unity ceremony options — a few you've probably seen before, two will require protective eye-gear, and a couple even involve science! Unity candles can be good for two or a whole family of people! Emily says, "We decided to light a unity candle to symbolize how our lives were going to burn close together from now on." Centered Ceramics came up with a salt ceremony. It works just like a sand ceremony, but the salt egg can become a fixture in your kitchen and used daily. When Claudia and Eddie got married, they brought together their children as well. So each family member had a colored sand that represented themselves and they combined them all together. What about taking the same concept of the sand ceremony but adding a personal spin… Celebrant Jessie Blum explained, "I love all things spiced and spicy — my husband is a salt fiend. So we did our own twist on a sand ceremony and poured white peppercorns and black lava salt!" Nicole and Sean shared a bread breaking ceremony: "The bread was from my favorite local baker, and was sweetened with honey butter I made from local organic honey." 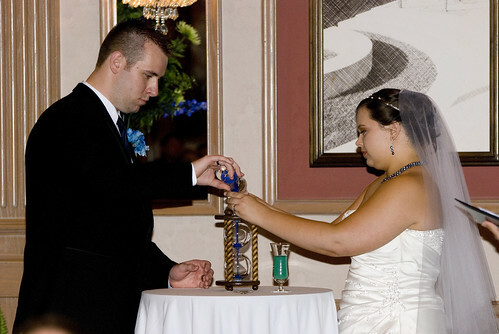 Handfasting, or tying your hand together to symbolize the joining together in marriage, is very popular on Offbeat Bride. Cat and Andrew came up witha science-based ceremony: "Since Andrew is a Chemist, and a big science nerd. His favorite moment was our special version of a candle lighting/unity ceremony. We each poured a vase what looked like plain water into a large pitcher, causing an instant color change from clear to pink. Magic! (I mean… science!) The audience gasped and applauded, and we were beaming." Tribe member Sneff and her husband planted a tree together during their ceremony. Similarly, Mina and Adam planted an Evergreen sapling, as a symbol of their love. We love this flower laying ceremony from Victoria & Jacqueline's wedding. "We loved the idea of incorporating the concept of eternity, and we'd tossed around the idea of a handfasting, but we ended up crafting our own ritual. All the guests came forward, picked flowers out of a vase, and laid them in two conjoined circles around us, making an eternity symbol. We placed this about halfway through the ceremony, so we stood in the circles through the rest." Unity cocktails are an Offbeat Bride favorite. We have an entire tag devoted to the them. Sarah and Todd did what they called a wine lock box ceremony. "Instead of a unity candle, we did a wine lock box ceremony. We sealed love letters and a bottle of wine into a box. Our officiant was thrilled to use the 'making of wine' as a metaphor for marriage. I LOVED getting to hammer nails in the middle of the ceremony." The photo above is from Flickr member Dirt2Mud's wine box ceremony. She explains, "The bottle was picked specifically as it should age well and be at its peak around our 5th anniversary when we will open the box. We also bought special break-resistant stemware." A painting ceremony has been brought up by a few of our brides. From a unity finger painting to Tribe member Zombiefrog Bunny's painting of concentric spirals, creating art together is a good way to honor your passions and your new partnership. Sarah Joy and Joseph are both pipe fitters so they had a welding ceremony. Warning: only to be attempted by trained professionals! Kaci and Roy had a unity volcano — you know, that awesome science fair project! We have SO many more ideas for you — pages and pages of them! Thanks to all the amazing offbeat brides who brought us all of these ideas, now to the rest of you… what unity ceremonies did I forget about? Hello! I love love LOVE the idea of Cat and Andrew's science unity experiment (for lack of a better phrase). My fiance Ken is a math teacher and I was a bio major/statistician, and we both love nerdy and fun things. Would anyone know how this magic (science!) happened? I assume some kind of pH indicator, but I would love to snag it for my own ceremony. Thanks! We need to do a color-changing water ceremony. This is a thing that needs to happen. We'll probably do something with kitchen-available stuff, though–from what I can tell, the example used phenolphthalein, and while really fun to type and say, I don't have the hookup to get it cheap. We'll probably just boil some red cabbage to get purple liquid, and combine our purple liquid with a clear base to get a pretty green-blue liquid. I'm weird, and I sometimes just do this when I'm bored and have some red cabbage lying around. Make the "clear liquid" part of your mixture lemon juice or other acidic-spike. This will turn your cabbage juice a lovely pink. Be sure to experiment with different concentrations of acid before hand to zone in on the exact effect you want. Oh, PS – Phenolphthalein will run you about $35 for 100g. Try Fisher Scientific or Restek for suppliers. Okay, really late to this party, but on another indicator note, you can also get clear to blue, but it isn't instantaneous as the clear to pink with phenolphthalein. If you mix iodine with vitamin C, it will turn clear. In the other vase, pour liquid laundry starch (you could also mix corn starch and water, but it will be cloudy). When you pour the two together, the mixture will take a few minutes to turn blue. Also, I typically find Frey to be the cheapest provider of chemicals & supplies (I am a high school science teacher). We used a German Bridal cup. Whats a German Bridal Cup? My fiance is German, I'm Australian, and we're getting married in Vietnam. I keep asking him for ideas on German wedding culture…cause I really want there to be a bit of both of us in our ceremony…but he's a bit hopeless, and doesnt really know any! "If your goldsmith can make a chalice from which two people can drink at the same time without spilling one single drop, I will free him and you shall become his bride". Inspired by love and with skillful hands, the young goldsmith created a masterpiece. He sculpted a girl with a smile as beautiful as his own true love's. Her skirt was hollowed to serve as a cup. Her raised arms held a bucket that swivels so that it could be filled and then swung towards a second drinker. Thank you for posting! It's really nice to see some of the creative ways other couples are approaching this. We did an hourglass ceremony. It's a take on the sand ceremony except we have a cooler memento and we will turn it on every anniversary. The idea is that when you put each color of sand in the glass they're inseparable but not entwined. As time continues on the colors become so entwined they are impossible to part. So it's a bit like a salt covenant, too. We liked the idea that it also portrayed the growth within marriage as well, since not a lot of unity ceremonies involve that aspect, but we thought it was important to point out that the best was still to come! I'll scrounge up a picture and see if I can stick it in the flickr pool. Holy crap! That is REALLY FREAKING COOL! Yes! Pictures! Done! I, er, forgot to add a description, but I'm OBT member Wowjunkie and the pic is a ridiculously tall man in a monkey suit and a chick in a white ball gown with blue pearls pouring sand into a wooden hourglass. Could you let us know where you bought your empty hourglass? We got ours from heirloomhourglass.com. We ordered our sand from them as well and I Goodwill'ed the holders. Heirloom hourglass seemed to offer the biggest variety of hourglasses we could find, and more importantly the hourglasses close with caps that are screwed on so we could immediately close it and turn (which was important to us – the first mixing of sand) and most of the others we had found you had to send off to have them recapped. They sell all sorts of different end caps so you could customize. I will warn you they're a bit pricey for my taste but ours is beautiful and it was really important to my husband. Oh, and it's totally possible to make your hourglass an actual hourglass but we decided not to drive ourselves crazy and meter it out. I'm not gonna lie, I got all teary-eyed reading this. I love this idea so much! Omg I'm sorry but I'm stealing it. We did plan on doing just a normal sand ceremony but when I read your post it really touched me. (Plus my fiance has a fascination of watches, and the first little gift he gave me was a bottle of red sand because I said I wanted to go to death valley in Nevada) Then when I found a site with the actual reading I started crying as I read it. I love it, and thank you so much for posting it, because now I feel like we have a ceremony that fits when nothing else was. This is amazing. And brilliant. Thank you for this idea! I've been toying with the idea of some type of unity ceremony for months but I can't decide what would work best for us and wouldn't be too over the top in our short, simple ceremony (we're already exchanging rings and having a reading on top of vows). They're all cool and fun, which makes picking the right one hard! I totally thought the "Bread Breaking Ceremony" said "Breaking Bad Ceremony". I was all like "wuuuuut! Do they make meth!?" Then I re-read it and it sounds NOMMY. My beau and I are big tea-drinkers, so we're going to have a tea ceremony. We'll mix two types of tea and letting it steep while we read our vows. Then we'll pour a cup for each other. Can't wait to hear how it goes in the ceremony, Angie! I've seen a painting ceremony where the bride had red and the groom blue. They each painted a side of the canvas, then poured the paints together and painted the center purple. Oh, and the groom tied an apron on his bride before painting to protect her dress — very cute. In the Hebrew Bible people would exchange shoes to symbolize a covenant . . . I could see that being really neat for a same gender couple as a way to twist a really ancient Judeo-Christian tradition. It could work for a couple of different gender expressions too, but there are more complications! Not to mention, the issue of shoe size! Usually I find unity ceremonies kind of saccharine and over used. We get it, you're turning two into one that's the whole point of marriage, way to figure it out. That said, I can totally get behind the magic "water" and volcano ceremonies. Not to mention the science flavor is perfect for humanist/atheist ceremonies. Hate to say it, but I might have to jack one of those ideas. For my husband and I, offbeat Christians, in our faith tradition, communion is the ultimate unity ceremony – as it means union both with God and with our fellow participants. At our wedding, there was communion for the whole congregation, and our first act as a married couple was to bring the bread and wine forward, to serve our community. I loved taking part in the ceremony, because it reminded me that my marriage is a part of a larger community, and those people took part in the wedding and pledged to support us in our marriage. What a good idea to cement the idea of service to the community. I love this. See this is why I'm sometimes jealous of religious couples. So many beautiful, meaningful ceremonies already built in. Yeah, I'm struggling to find how to fill a secular ceremony with things that are meaningful to us. In the Tribe, there's a secular group with lots of ideas how to make a beautiful non-religious ceremony. We had a "rose ceremony." It's pretty similar to the sand ceremony, but using a vase of flowers (roses). Two were already in the vase (us), and four others were on the table the vase was on. Each of our four parents came up and took one from the table, with my parents giving theirs to my husband and his parents to me, then us placing the roses into the vase. It was meant to symbolize not just us starting our own family, but of each of us being welcomed into our existing families. I went to a wedding where the bride and groom soldered together two halves of a copper wire heart, which they later attached to a wooden plaque to hang on their wall. It was adorable, and perfect given the groom has been tinkering around and building electrical stuff since he was a kid. So we are in the process of making a Spin Art Ceremony in which we make a badass spin-art painting. Each of us will use one color and then the paint will spin joyously together like our love. Also, we are both little kids at heart so this is perfect for us. We kind of did the Wine Lock Box Ceremony just minus the wine. Neither of us are big drinkers so the wine part didn't make sense for us. Instead we filled it with mix CDs, copies of toasts that people were going to do at the reception, and then each year on our anniversary we're going to put some pictures in of what we've done in the past year. We've decided not to read the letters until our 15th anniversary. We're both huge beer snobs, so we're having a "beer making" ceremony, where all our attendants (i.e. closest, dearest friends) will contribute handfuls of grains into a giant bowl, then my fella and I will add the last handfuls, stir them all up, and (later) brew a beer from what has been collected to share with all our friends. We're planning on composing something profound about fermentation and maturation being parallels to the growth of our love to be read while people are mixing. I love this idea! You can have all kinds of symbolism for the hops, the malt, and the grain. Great metaphor for life and partnership!! Thanks for sharing these! One of the most common questions I receive from my brides. Hi guys, well we're christian and we found the unity cross ceremony appealed to both of us. The site defines the different parts as being female and male but I disagreed so I think our pastor is going to make it more about us. Its pretty and we're excited to have it be a part of our decor in our home. But I gotta say the hour glass thing is AWESOME. Sheri, I had never heard of the unity cross ceremony until reading your post. After researching it, it's perfect! (Plus, I think my parents – who are a little sad that we aren't getting married in church – will be a fan). Thanks. We're doing a version of the wine box ceremony (I've seen it called the anniversary box, so that's what we're calling it). I love the science experiments though! So tempting, but I think we have enough meaning and enough length to our ceremony as is. I love some of these ideas, y'all are so amazingly creative! The Dude and I are in talks of mixing some of these together into a cool, nerdy unity ceremony. We were thinking of each making a "cocktail" of what makes us individuals and combining them into a mason jar that we'd seal and keep on display in our home. For example, mine would be made of little buttons and beads, bits of thread, some spices and tea leaves. His would be tiny broken microchips, cut-up Magic the Gathering cards, coiled bits of wires and guitar picks. I'm wondering if this would be really symbolic of our vastly different lives coming together as they have in the past (by then) 10 years, or if it would be something dumb that we'd just end up tossing out with other junk. We are planning a Ring Warming ceremony. The rings will be circulated through all of our seated guests starting with my sister (my mother has passed on) and ending with Mr. D's step-mom. It gives an opportunity for everyone to infuse our rings with their prayers, good wishes and positive energy before we say our vows and exchange rings. We sooo appreciate the support of our loved ones! We are having an intimate wedding of 80 guests max – not sure if this would work for a large wedding. I know I'm spilling the beans, but what the heck. Mi amor and I are actually doing a color blending mini-ceremony. We'll come in wearing accessories in separate colors (him green tie, me blue gloves). After we exchange vows (but before the kiss), we'll swap out our accessories for blue-green items to show that we are united in spirit but will always maintain our own identities since within the right shade of blue-green you can see each color separately. Love the hour glass idea! We're doing a version of the Hindu seven blessings for our vows, where the couple takes seven steps around a sacred fire and a blessing is read for each step. The wording will have to be changed a little as it's very "the man will provide and the woman will care for the home." One of the blessings is for many healthy children, and we're not crazy about having kids so we'll probably change that one too. My hubby-to-be also wants to do some type of candle ceremony so we'll incorporate that in with the fire I think. glad to see folks catching on to what us Celebrants do!!! this is the good stuff. I'm thinking about doing a handfasting using multiple wide ribbons – one from each guest – and giving the guests an opportunity to write messages on their ribbon, and maybe weave them all together. This obviously only works for a small group of guests, but the idea is that they have all contributed to who we are, and we're making a commitment to them as well as to each other, and counting on them to support our relationship. Also, we'll have the ribbons to keep – maybe hang something on the ends to make a windchime? we're having two! but not both during the ceremony. we're doing the sand during the ceremony, but then also the wine box. BUT! there's a twist! each table will have a bottle of wine on it and some gold/silver markers that they can use to write messages on the bottle with, like a guest book. there'll be a little station set up where guests can put the bottle in a numbered box (the same number as their table number), seal it up, and we'll open the box on the corresponding anniversary (so we'll drink table 5's on our fifth anniversary, etc.) our table numbers don't go from 1 -10 though, they're just random numbers that have a special meaning for us (e.g. '16' the day in march we met, '29' the street number of our first home together). You only have this day once so may as well do it however you want!! Amazing! We're both geologists but from hardrock regions in Scotland. There will be some rock-ness in there somewhere but for unity ceremony we'll propably use a quaich, and share a dram. Oh man. I wish we would have thought of the bread breaking ceremony. We were stumped, so we didn't do anything. Scott would have been so excited! Bread is his favorite. We had a unity campfire! We met at a summer camp and had the wedding there, and deciding that was the only thing that really fit us. I even had a ceremonial apron to make sure my dress didn't get dirty while we lit the fire. Love the eternity flower idea – very sweet and simple. We had a take on a handfasting as well as a tasting ceremony. We are having our ceremony outdoors in my dads backyard, and there is a firepit next to where we will be at. We decided that we are going to use two marshmallow roasting sticks together to roast a marshmallow and have a unity smore. Dorky but delicious. Our twist on both the unity cocktail and the tasting ceremony was to do ritual hot chocolate; each ingredient (cream, chocolate, sugar, spices) had a symbolic meaning, we assembled it together as part of our vows, and then we drank it together. Delicious and very meaningful, and now we have an anniversary tradition! We're going to do an hourglass sand ceremony, with the officiant also pouring sand to symbolize God (as we are Christian). When we have kids an the become old enough to understand, we want them to be able to add their own sand to it too 🙂 in this way, it will symbolize our family becoming closer to God and each other over time. What a cool idea!! We're doing a Ring Warming but I secretly want a Unity Volcano!! I love the idea of the scientific water ceremony. Can you tell me what the two chemicals are? Phenolphthalein is a pH tester, it turns purpleish pink when a base is present– FH and I are using this one (after we tried luminol and bleach to make a glowing reaction, it's too fast though…it's just a flash of light)and anything basic would work as your other "water" or clear liquid– ammonia is what we're using. You can order it online– we got ours from United Nuclear for just a few dollars. My FH and I are going to do to this ceremony with the phenolphthalein and pH 10 in water. I work in the pharma industry and this is perfect to "wow" our guests. I am struggling with wording for the ceremony though. Does anyone have any suggestions on what our officiant should say? My fiance and I are both chefs. We met in culinary school, so we're doing some kind of unity ingredient. We still haven't decided which to use… salt and pepper, cinnamon and sugar… there are SO MANY TO CHOOSE FROM!!! We are both huge horror movie buffs… especially zombie movies… And we are having a horror movie sort of theme to the wedding. So we are going to slay a zombie together. Paper mache zombie head. Stuffed with red confetti… hopefully his head will pop just right when we hit him so the confettie blows everywhere! We are making a sand globe with our guests. We will pass around an empty globe on a tray with a bowl of sand and a bowl of shells. Each person will be asked to add a scoop of sand and a shell into the sand globe as they make a wish for us. We will each add the final sand and shells. Then it will be sealed up later (after wedding) and we will have a beautiful sand globe of wedding wishes for our home. My wedding favors are small (4") sand globes I made. This idea only works for a small wedding but is perfect for my destination wedding in Costa Rica with about 30 guests. My intended and I are planning to do a unity-wax-sealing. For my 16th birthday, I got a wax sealing kit (for sealing envelopes with your personal "crest", you know? ), and every letter I ever wrote to my man was sealed with wax and my stamp. In our courtship, the Celtic eternity knot has come to mean a lot to us. How does this all combine? I love it! That sounds very special. my husband and i did our own take on the sand ceremony, using soil from our hometowns. Did you have an issue with the soil afterwards (getting moldy or anything)?!? Love this idea! We did a flower ceremony where we had a vase of roses on a table and each of our four parents had an individual rose which they brought up and gave to us (my parents to my husband, his parents to me) to place into the vase. This was meant to symbolize that instead of us leaving our families, we were all joining to become one family. My dude and I are planning on doing a whiskey ceremony. I found a 1-liter white oak barrel (Amazon, $45). Dude and I will both have 1/2 liter bottles of unaged whiskey that we'll pour into the barrel to be drunk on our first anniversary. Because awesome.